Sunny. Sooyoung. Tiffany. Jessica. Yoona. Yuri. Seohyun. Taeyeon. Hyoyeon. Who are these girls? If you’re a Kpop fan and you don’t know who SNSD are, are you really a kpop fan? (When I say K-Pop fan, I mean a person who listens to K-Pop music and knows variety of K-groups.) SNSD is one of Korea’s brightest stars and they’re usually on the front page of Allkpop. But they never reached their success without experiencing some hardships. When they debuted with Into The New World, they already had a fanbase and are now called the SONEs. Well, if they have fans, they also have haters. Legends said that the main reason why they had a large number of haters because they were close with male idols. But who knows right? Or maybe these haters are just jealous on how pretty these girls are. Well, speaking of haters, one main highlight of SNSD’s career was their first Dream Concert in 2008. What happened? The dreaded BLACK OCEAN. What’s a Black Ocean? K-Pop groups have their own fan colors. For SNSD, it’s Pastel Rose Pink. So the fans carry these light sticks during a concert or a performance of the idol. 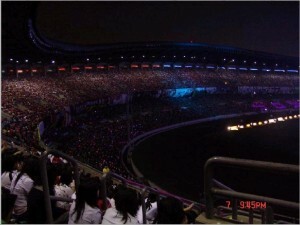 SNSD’s Black Ocean happened during the Dream Concert which is a concert where there are also other groups performing. The place is packed with different fandoms and they are all seated according to their fandom. Now, there are two main theories why the Black Ocean happened. 1. There was a FANWAR which occured when members of different fandoms had some misunderstanding that they decide to sabotage the other fandom’s idols. They said that fanwar was the main reason why there was a Black Ocean for SNSD, fanwar between SONEs and CARTEL, Cassiopeia (DBSK), ELF (Super Junior) and Triple S (SS501). 2. They just don’t like SNSD. Maybe they have their own reasons but CARTEL decided to put the matters on their own hands and just decided to turn off their light sticks. But whatever the main reason was, I don’t think it’s worth opening up because these four fandoms are kind of civil with each other. Let’s keep it that way. In short, Black Ocean occurs when a fandom decides to turn off their light sticks when a specific group is performing. This is uncommon in K-Pop. SNSD’s Black Ocean. You don’t see much lights from other fandoms. While watching their performance, I really felt bad for them. They prepared so hard for this and was expecting to do their best for the audience. Can you imagine the shock and pain that they might have felt when they saw the Black Ocean? You can actually feel it on their voice and see it in their eyes. Most of them, if not all, we’re holding back tears. You can hear their voices cracking and some went out a bit of tune. It was a sad moment. But the girls did not breakdown, they proceeded to perform as what was practiced. After their performance, we never knew what happened on the backstage. Did they cry? Got angry? I wasn’t a fan yet of SNSD when this happened. I knew about them through a friend when she told me to watch Gee. This was the typical cutie K-Pop music videos and typical inside the box favorite of SM Entertainment. But, this was the MV that rose them to their status right now. It was a big hit that they became a hit and started gathering more fans in and out of Asia. They were then given the title “National Girl Group” because of their fame and influence. They bagged more commercials and endorsements than ever before. SNSD definitely had already made an impact in Korea. Some of the are also acting now and Taeyeon I think recorded the most OSTs out of the nine. They are all over the news. But is this really everything for them? What’s next? I want them to have relationships, like a bf-gf relationship. That’s normal but not for them. Some fans thinks that they own these girls that the thought of them dating sounds like a very big issue. But let’s just pause and think, they’re not getting any younger. They need someone to take care of them. Hyoyeon said that she wants to get married early. I’m pretty sure some of them have a special person in their life. Let’s just give them what they want, okay? Also, I think they should cut the cuteness now. They became popular because of aegyo but I think it’s time to slowly cut that off now and start showing more mature side. I Got A Boy was awesome (but too colorful don’t you think?). Their IGAB album was cool and was full of new music that definitely suits the SNSD now. They really are going with the flow. In the future, we hope to see SNSD succeed, either as a group or as an individual. SNSD, FIGHTING! Next postWhat Did the Fox Say? I just read in a forum a comment about SNSD’s Black Ocean and had no idea what was about – thanks to your post now I understand perfectly how intense and dramatic this must have been for them! Considering how much eastern audiences tend to be much more respectful and caring about artists in general in comparison to western ones, this attitude can be acknowleged as highly aggressive and could had had a very negative impact in their early years, back then. For our luck as fans it didn’t – rather the opposite, it may have strenghtened their bond and willpower (much as well as SONE’s) as their history as such a strong group shows. By the way ‘Mr Mr’ seems to go in the direction you pointed out – less cutie and more mature – don’t you think? Best regards! Reblogged this on sweetiegurl2000's Blog.